OKOK Healthcare Management, an application for use with the smart Bluetooth scale, records and manages your body weight measurement results. 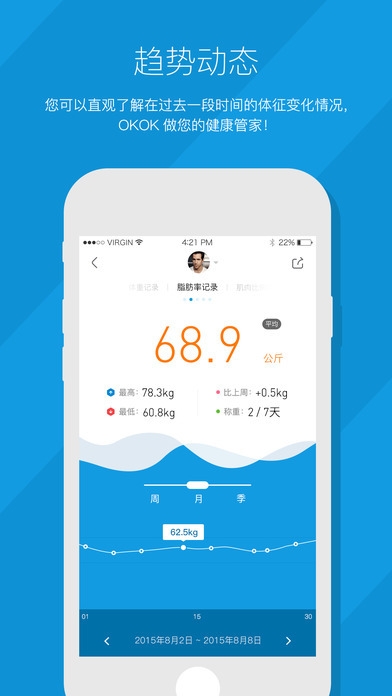 With this APP, you can use the Bluetooth scale to check and manage various health indices for body weight, body fat, body water, muscle and etc. Though mainly used for body weight control, this APP utilizing your health indices also give you advice on everyday sport, food and sleep. This app support the Apple 'Health' App, If you authorized, we can sync all weight data to you Health app.